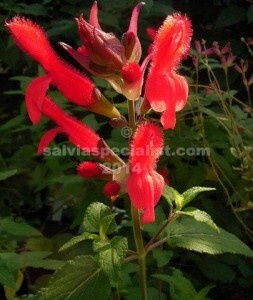 This salvia was given this name in New Zealand where they had lost track of the original name but we think it is fulgens. A kind nurseryman with quarantine brought it into Australia for me. ‘Red Dragon’ is not the strongest plant for me so perhaps I haven’t found the best spot in the garden. I saw it growing strongly around 2m high in New Zealand in summer. It could be that it prefers the milder and moist conditions of New Zealand than my very hot summers. It is supposed to take a number of degrees minus but I don’t trust that since I lose it easily anyway. ‘Red Dragon’ has unusual flower buds that are very distinctive Not surprisingly it flowers red. It is easy to grow from cuttings. I wouldn’t trust it in severe frost and it doesn’t like drought.